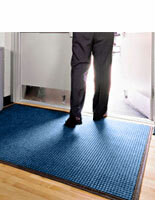 These blue entry mats are made with polypropylene plastic fibers that will absorb water and dirt, keeping flooring clean. The doormats make great entrance carpeting for a number of locations such as supermarkets, malls, retail stores and workplaces. 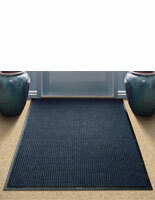 Each of the entry mats features a neutral finish that will match any environment. 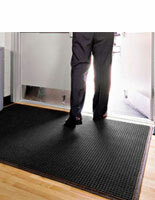 The doormats are rated Certified Slip Resistant by the National Floor Safety Insitute with their rubber backing and gripping plastic fibers. 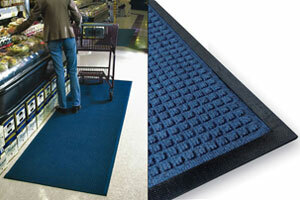 The mats for retail stores are also anti-static rated at 1.2KV by the AATCC, making them an ideal choice for safety. 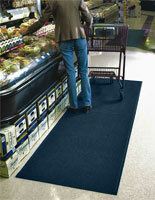 The carpeting covers a large floor area with its 3' x 10' design.